Jeremy [The Wolf]: Tell us about how you became involved in "Justice League: Gods and Monsters" and how does it feel to be one of the top "go to" people for DC Universe Animated... which is awesome by the way? 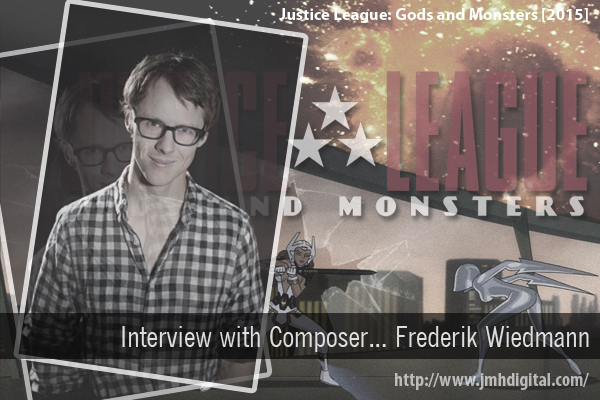 Frederik Wiedmann: I feel incredibly honored to be trusted by Warner Brothers Animation for so many of their projects. I really love working on them, it’s been such a wonderful couple of years filled with superheroes in my studio. In terms of Justice League GAM, I am not entirely sure how it all went down, but I did get a call at some point from WB offering me the job. I knew Bruce was involved in this one, and I get extremely excited. Working with him and Giancarlo Volpe on Green Lantern TAS was such an inspiring year and half for me, and I was thrilled to work for Bruce again. Jeremy [The Wolf]: How do you find your inspiration from project to project and is there another artist/composer you listen too currently that moves you? Frederik Wiedmann: I get mostly inspired by the visuals that I am looking at, combined with what I hear during my conversations with my film makers. Often the people that I work with (Producers, Directors) have a very clear idea about what they want in the music, how they want to audience to feel, and how they want to movie to feel. Based on all these things my head usually starts spinning and I go! I am a big film music nut, so I do listen to a lot of it myself, when I am driving my kids to school (My 4-year old loves Pirate of the Caribbean music!) and on my own time. I think my favorite composers are John Powell (how to Train Your Dragon, Bourne), Henry Jackman (Captian America, Big Hero 6), Christophe Beck (Ant-Man, Frozen). These three continue to inspire me with each score they bring out. I love it. Jeremy [The Wolf]: Share your recent involvement in "Spectrum" and your opportunity to get the message out for this cause? Frederik Wiedmann: Spectrum was a very special project. I know Jill Jones (Director) and Brent Yontz (Producer) very well now, and they are so incredibly talented. Spectrum is a very unique look at Autism, a very optimistic look. I really wanted to convey the message of the doc with the music as well. When you see the film (available on vimeo), you will see that it is a very fresh way to look at Autism, and it is a really incredible experience to see through the eyes of the people in the movie. We wanted the audiecne to see that there is a certain beauty in the perception of an autistic person, which sometimes can be inspiring (like for the Poet or the Painter). The music really had to support the message of the doc, to look at Autism not as a disease, but as a different way to see the world. Jeremy [The Wolf]: What is next? Frederik Wiedmann: I have a great thriller coming out soon (not sure when the release date will be at this point), it’s called ‘Shut In”, starring Beth Riesgraf. It’s a really great story with lots of great twists, so keep a look out for that one. Also more DC work in the pipeline, The titles of these will be revealed in time. Also, if you have Netflix, you can always tune in for more ‘All Hail King Julien” (a Madagascar spin-off), or my new show “Miles form Tomorrowland” on Disney Junior. So I wanted to share some of the cool stuff from "THE WOLF", even though it's turned into a big ad site... there is some quality content. Spectrum sounds like a labor of love. Cool he's done so much work with DC. And I have seen all of the Madagascar shows. My wife insisted! The creative team behind those DC movies are legendary, so to spend a year on it must have been incredible. Great interview!